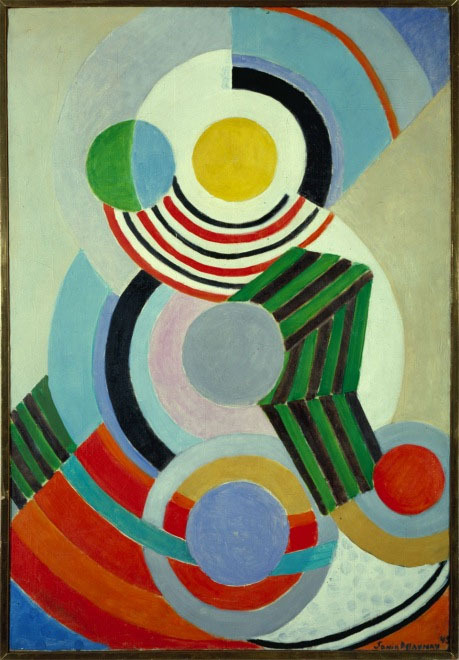 Sonia Delaunay was born into a poor Jewish family in Ukraine but was adopted by a wealthy aunt in Saint Petersburg and had a privileged upbringing, She was sent to Paris to study at Academie de la Palette. Her early work shows influences of Post-impressionists and fauves and it was not until 1910 her marriage to artist Robert Delaunay that the couple founded Orphism, a sort of psychedelic visual depiction. This name was coined by poet Appollinaire from Greek musician Orpheus, a harmonious colour scheme representation. After her impressionist phase, she also experimented with analytical Cubism in mode of Braque & Picasso. She not only took her sense of movement through colour contrasts to canvas but to textiles, fashion and to interior and theatrical design. She spent some time in Portugal & Spain collaborating with Sergei Diaghilew in designing things for Ballet Russes. After her return to Paris, she made sets for Dadaist plays & films and made clothes for the likes of Hollywood star Gloria Swanson. It is a large exhibition of comprising twelve rooms showing plenty of her works during each phase of her life. There so not much of angst of modern artist but a harmonious lyrical use of colour and form. Looking at her late large paintings, one sense her as a precursor of things to come- hippy movement & the paintings of Warhol & Liechtenstein.